Thelma Louise Lewis, daughter of Calvin Lewis and Eveline McGhee. Thelma Louise, the sixteen months old daughter of Mr. and Mrs. C.L. Lewis, of Route 4, Cartersville, passed away at the home of her parents last Thursday and was buried Friday at the Macedonia Cemetery. The funeral service was held at the Macedonia Church, Rev. Sandy Bennett preaching the funeral sermon. G.M. Jackson & Sons of Cartersville had charge of the funeral arrangements. Besides her grief-stricken parents, Mr. and Mrs. C.L. 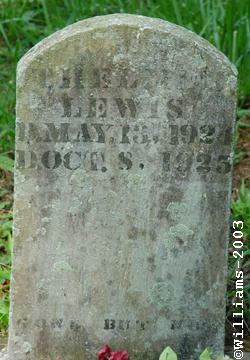 Lewis, the little girl is survived by one sister, Carrie Mae Lewis, and a host of other relatives who will miss her very much.